I’ve camped by the Wain Stones as well. McColl’s song, written in the 1930’s, starts like a ‘tick list’ of the walks well known to the working class Mancunian hill-walker of the time. Although I know Snowdon well enough, my knowledge of the Derbyshire Peak District is limited to no more than a handful of days out. There’s less excuse for this now that I live in West Yorkshire, as it’s as easy to get to parts of the Peak District as it is to get to the Yorkshire Dales or Lake District, but I still tend to head north and west rather than south. The new car had a niggling problem with the engine management computer, and had to go back to the dealer to be fixed. The job was expected to take at least half a day, so I needed something to do to pass away a few hours. 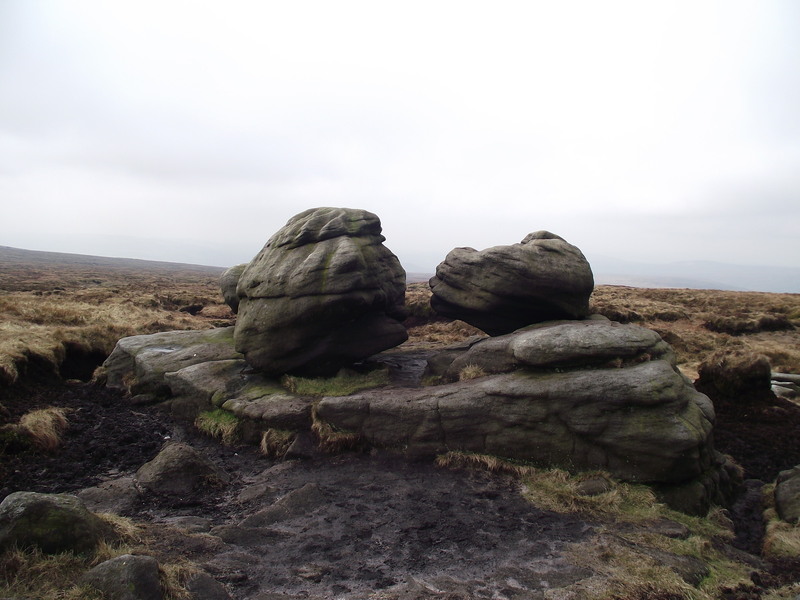 The garage was near Glossop on the edge of the Peak District, so there was no competition – I would walk out over Bleaklow to visit the Wain Stones in McColl’s song. 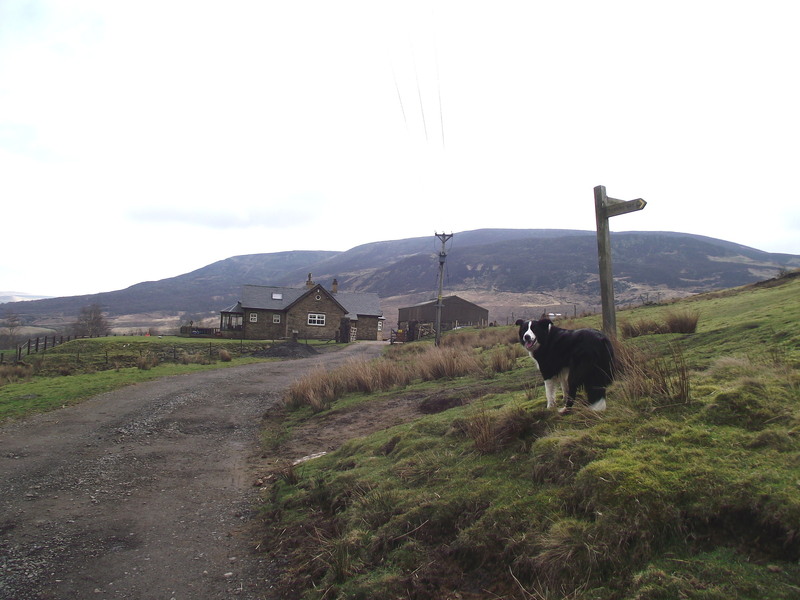 I dropped the car off at Padfield, and set off with ‘Mist’ on the Longdendale Trail. 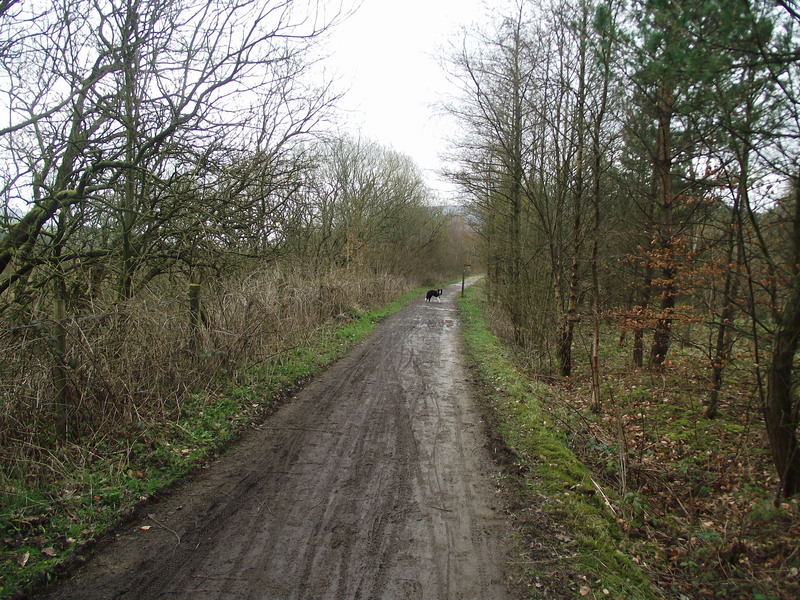 The route follows the old railway line over Woodhead, and forms part of the Trans-Pennine Trail that runs coast to coast from Liverpool to Hull, and having the gentle gradients of a railway it makes for fast and easy walking, especially with an impatient Border Collie as a companion. 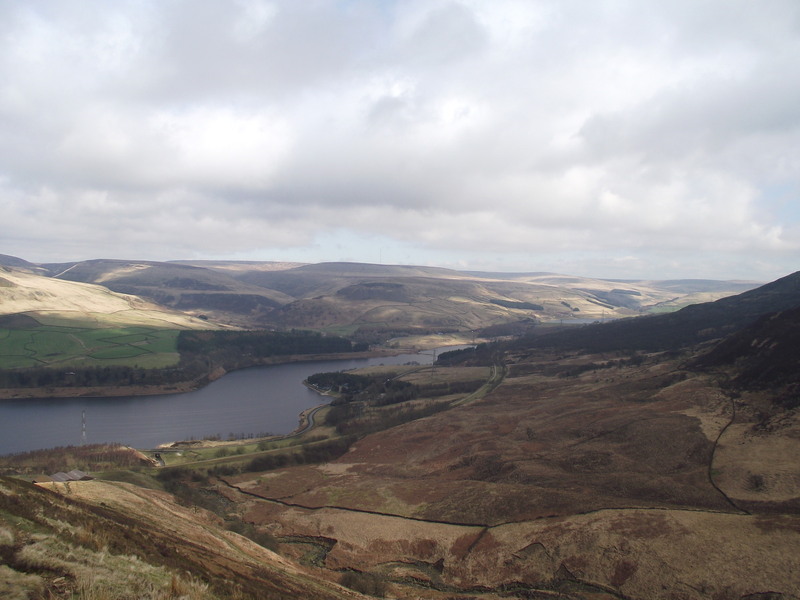 The flat gentle trail doesn’t last for ever though, and soon it’s time to gain some height along the edge of Torside Clough, following an even better known long distance path, the Pennine Way. 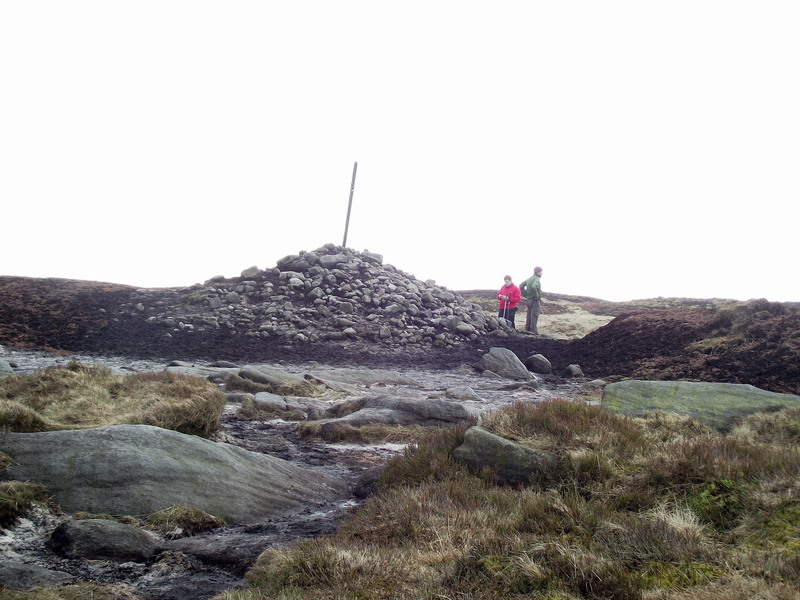 After Clough Edge, the route follows the stream of Wildboar Grain through typical Pennine countryside, arriving at last at the large cairn at Bleaklow Head, with the Wain Stones nearby at the highest point of 633 metres. From the Wain Stones, a path heads down next to a stream, heading for the junction with Wildboar Grain that I had passed earlier. My route from there was over Harrop Moss, where I encountered the first true Pennine walking of the day – wet, sticky, black peat! 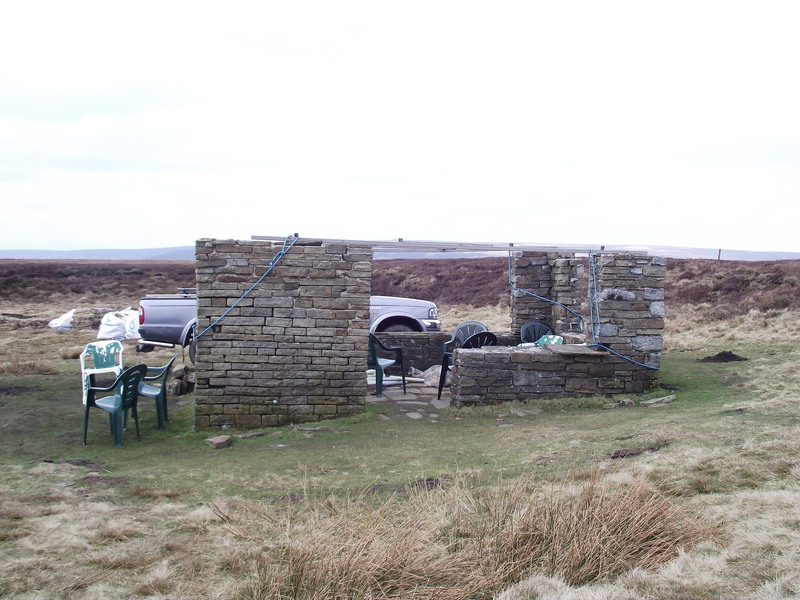 A succession of wooden duckboards kept me out of the worst of it, and took me to a curious looking construction high on the moors at about 480 metres altitude. It looked like a suburban patio had been dropped there, but a more likely explanation is that it’s a shelter for shooting parties; the duckboards were probably also for shooters. From here it was all downhill back to Padfield, where the nice people at David Oldham Ltd. had not only fixed the car in less than the predicted time, but had also washed it as well! What brilliant customer service – how many other companies would take so much trouble? "I've seen the white hare in the heather"
I heard a curlew but didn’t see it, but I did see white hares – three at least, possibly four. The Mountain Hare (Lepus timidus) is a relative of the Arctic Hare and is more usually seen in Britain in the Scottish Highlands. The hare is not originally native to Derbyshire, and was introduced for the hunting entertainment of the local gentry. 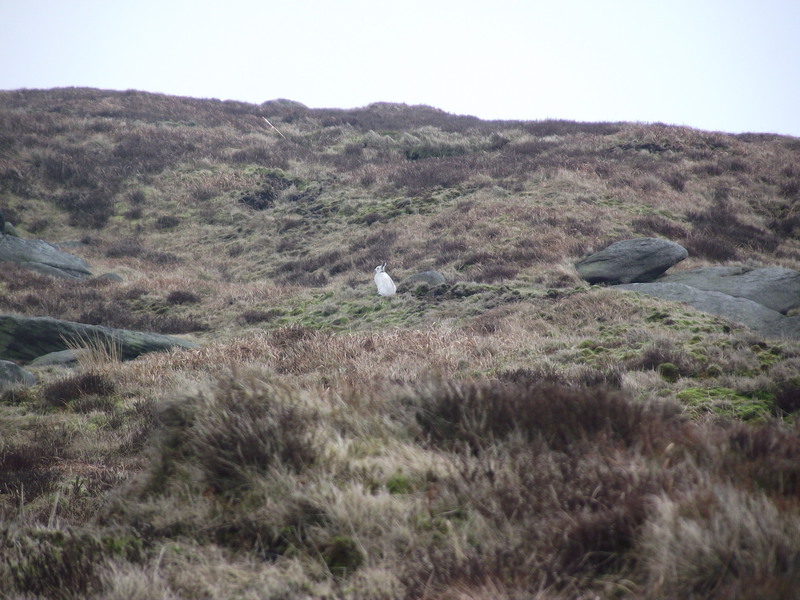 Their white coat makes them quite visible on the moors at this time of year (early spring), but the longer days soon trigger a response that turns the hare’s coat back to a more useful camouflage brown. Note – Although McColl is well known as the author, “Manchester Rambler” is often regarded as a traditional folk song. Versions differ due to the ‘folk process’, where subtle changes creep in to established songs. This entry was posted in 4. 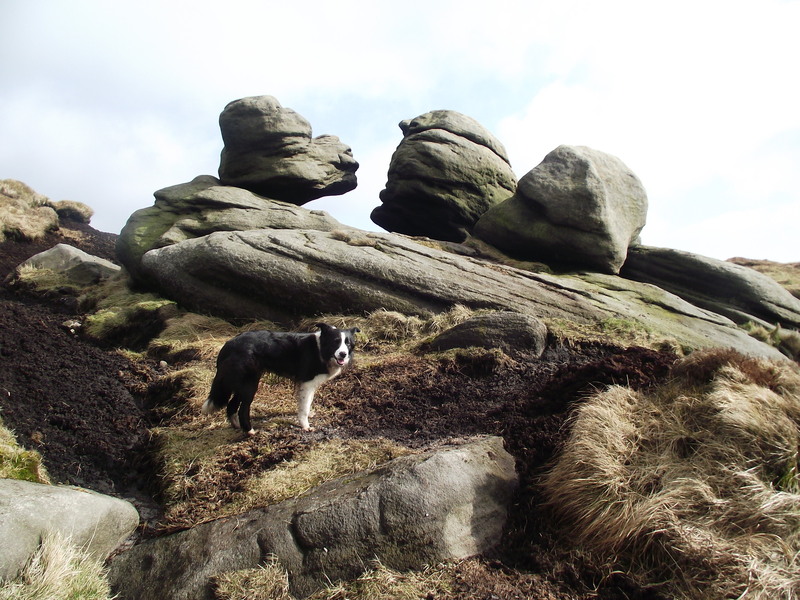 Northern England and tagged Bleaklow, Border Collie, hillwalking, Peak District, Pennine Way, Wain Stones. Bookmark the permalink. 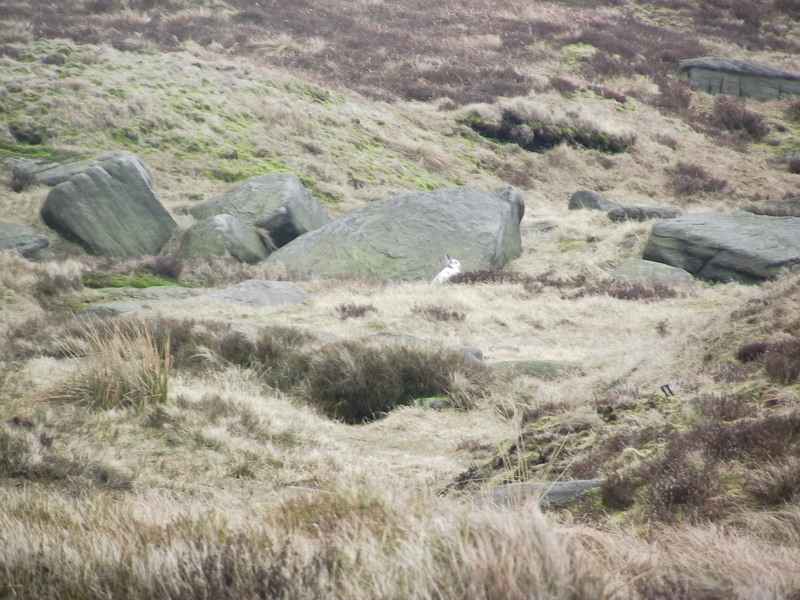 lots of white ‘hares’ here as well, but mostly on my head!! Hmm, better white ‘hares’ than no hares!